SALT LAKE CITY, Utah - HARMAN's DigiTech today introduced its next-generation Whammy pedal, building upon one of the most iconic guitar pedals recognized by guitarists around the world. The new Whammy features the classic Whammy sound that guitarists have embraced for over 20 years, and moves to the next level by introducing chordal Whammy pitch-shifting, additional Whammy intervals, and true bypass. For over two decades the Whammy pedal has been known as the ultimate pitch-shifting pedal in the world, used by everyone from Jimmy Page to Tom Morello and heard on songs like "Seven Nation Army" by the White Stripes. The introduction of new possibilities with the Whammy pedal reinforces its legendary status of the pitch-shifting realm. "The release of the new Whammy is the latest chapter in the pitch-shifting revolution. Bringing together the best of the original Whammy with the latest developments offering both classic and chord shifting modes, we are giving guitarists a reason to rediscover the unrivaled tone that makes this pedal a legend in the first place," stated Rob Urry, vice president, HARMAN Professional Division and general manager of Signal Processing and Amplifier Business Units. Offering true bypass means that the signal from the guitar is completely unaffected by the Whammy when it's switched off, maintaining all the purity of the guitar signal when the player doesn't want anything altering his or her sound. This can be especially important when using a lot of pedals on a pedalboard. The Whammy won't alter your sound - until you want it to! The Whammy also includes 1/4-inch inputs and outputs, a MIDI input that allows control of the pedal from an external MIDI device, and a 9-volt DC power input. The Whammy employs high-quality 24-bit/96kHz analog-to-digital and digital-to analog converters for clean, smooth pitch-bending sound. An on/off switch engages and disengages the Whammy effect, and a "Classic/Chords" switch lets players select either mode. 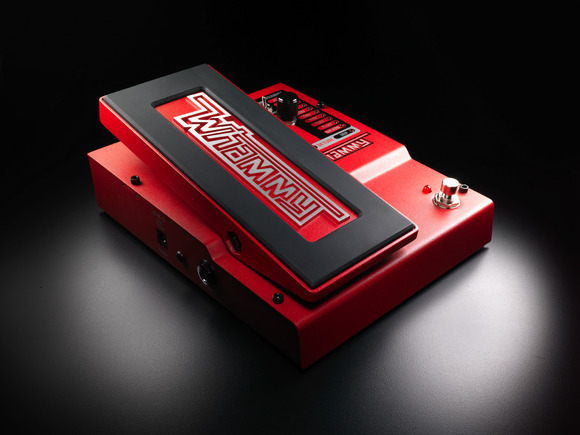 The Whammy is built to withstand the rigors of the road, with a rugged all-metal chassis, pedal and footswitch with a bold "Whammy" logo proudly displayed. HARMAN (www.harman.com) designs, manufactures and markets a wide range of audio and infotainment solutions for the automotive, consumer and professional markets - supported by 15 leading brands, including AKG(r), Harman Kardon(r), Infinity(r), JBL(r), Lexicon(r) and Mark Levinson(r). The Company is admired by audiophiles across multiple generations and supports leading professional entertainers and the venues where they perform. More than 25 million automobiles on the road today are equipped with HARMAN audio and infotainment systems. HARMAN has a workforce of about 13,000 people across the Americas, Europe and Asia, and reported net sales of $4.3 billion for the twelve months ended March 31, 2012.